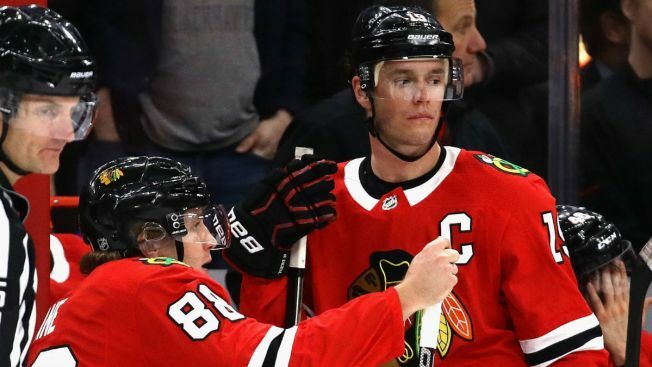 The Chicago Blackhawks have their league-mandated bye week coming up, and they looked as though they’d checked out early after a 4-0 drubbing at the hands of the lowly Detroit Red Wings. The Blackhawks, who now find themselves a point out of a playoff spot and could find themselves even further out of contention when they return to the ice, showed little punch early in the game, and even when they ratcheted up the intensity in the third period, it wasn’t enough as they went into their break with a sour taste in their mouths. Such letdowns before a break are not uncommon for the Blackhawks this season. When facing a break of three days or more this season, the Blackhawks are now 3-4 this season, with two straight losses at the hands of the New Jersey Devils and the Red Wings. When they come back from such a break, things have gone even worse, as they have a staggering 1-5 record in those contests. That second number is where the Blackhawks need to be focusing their attention, as they have just 37 games left on their schedule. The Blackhawks could find themselves four points behind the Wild and potentially seven points behind Dallas, as the Stars have three games while the Blackhawks are off the ice. The bye week timing is pretty rough for a Blackhawks team that’s in danger of missing the playoffs for the first time in a decade this season. With Corey Crawford still on the shelf and with players like Jonathan Toews and Duncan Keith still trying to figure out their games, the Blackhawks are facing obstacles that they’ve never had to face before, and it’s looking like it will be an uphill climb to get back to the postseason. With all of that in mind, next week will be a make or break test for these Blackhawks. This team has shown time and again that they can turn things up a notch when the postseason approaches, but this year they are going to have to get moving even earlier than usual, as games like Sunday’s loss have left them in a position where every point is crucial. No savior is going to walk through the doors of the United Center this year. It’s going to be up to guys like Toews, Patrick Kane, and Brandon Saad to bring this team from the precipice of irrelevance back to serious playoff contention. The Blackhawks simply do not have the cap space or the prospects to swing a deal for a true difference maker at the deadline, so the only way that they will be able to get into the postseason will be to dig deep and to find that championship will that they have shown in the past. The real question is whether or not they will be able to find it before it’s too late.